Bass drum. The bass drum usually sits on its side on the floor and is played by stepping on a pedal with the right foot. This drum is generally between 18 and 24 inches in diameter and between 14 and 18 inches deep. Its sound is the foundation of the rhythm of a band, often pounding out the basic pulse of the music or playing along with the bass player’s rhythm. Snare drum. The snare drum is a shallow drum (typically between 5 and 7 inches deep) that’s 14 inches in diameter and has a series of metal wires (called snares, hence the name snare drum) stretched against the bottom head. When you strike the drum, the bottom head vibrates against the snares. What you hear is a hissing sound. The snare drum creates the backbeat (the driving rhythm that you hear in most popular music) of the music and is what makes you want to dance. Tom-tom. The tom-toms are pitched drums that are usually between 9 and 18 inches in diameter. A drumset commonly has at least two, if not three, of them (some drummers, such as Neil Peart from the 1970s rock band Rush, have dozens of tom-toms, so go wild if you want to). Generally, the largest tom-tom (called a floor tom) is set up on the floor with legs that are attached to the shell of the drum. The smaller tom-toms (often called ride toms) are attached to a stand, which extends up from the bass drum or from the floor next to the bass drum. These drums are used for fills (a fill is a break in the main drumbeat) or as a substitute for the snare drum in some parts of songs. Hi-hat cymbals. The hi-hats are cymbals that are mounted on a stand, one facing up and one facing down, and are 13, 14, or 15 inches in diameter. The stand has a pedal that pushes the cymbals together (closed) or pulls them apart (opened). Your left foot controls the opening and closing of the hi-hats with the pedal while you hit the cymbals with a stick. The hi-hats can make either a “chick” sound when closed or a “swish” sound when open. You use them with the bass drum and snare drum to create the basic drum beat. Ride cymbal. The ride cymbal is an alternative to the hi-hats. Ride cymbals range in size from about 16 inches all the way up to 24 inches across (20- and 22-inch ride cymbals are the most common). The ride cymbal is traditionally used to create a louder, fuller sound than the hi-hats and is often played during the chorus of a song or during a solo. Crash cymbals. 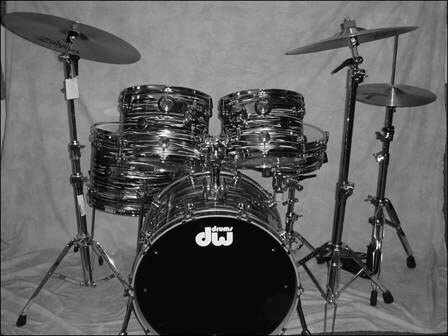 The typical drumset usually has one or more crash cymbals used for accentuating certain parts of the music, usually the beginning of a phrase or section of a song. These cymbals create a sound that resembles — you guessed it — a crash, not unlike the sound of a frying pan lid hitting a hard floor, only more musical. Crash cymbals generally range in size from 14 inches to around 20 inches in diameter. Figure 1: The modern drumset. The following aren’t included in Figure 1, but many sets include them. Splash cymbals. Crash cymbals aren’t the only accent cymbals that drummers use with today’s drumsets. Other cymbals include the splash cymbal, a small cymbal usually between 8 and 14 inches in diameter, which makes a little splash-type sound. The splash cymbal is kind of a softer, watery-sounding version of the popular crash cymbal. Chinese cymbals. These accent cymbals have become common over the last couple of decades or so. Chinese cymbals have a slightly rougher, clangier sound than a crash cymbal (more like a trashcan lid). They range in size from around 12 inches to 20 inches and usually have an up-turned outer edge. They’re often mounted on a stand upside down. Gongs. These cymbals were really popular additions to drumsets during the stadium rock era in the 1970s when drumsets were huge and drum solos were a staple. Gongs actually come in many shapes and sizes, but the most popular are large (up to three feet across) and very loud.